Former Union Minister and DMK’s south zone organising secretary M K Alagiri’s supporters perhaps did not realise that not attending a birthday party would cost them so dear. But then they should have, considering the party was none other than Alagiri’s bete noire and younger brother M K Stalin’s. The party’s recent decision to issue show cause notices to 15 Alagiri loyalists for not attending the anointed heir’s birthday celebrations in Madurai is being seen as a move that could only alienate Alagiri further. After the sibling rivalry came to the fore last year, show cause notices have been issued for the second time to Alagiri loyalists. The message is clear: all should know the boss is Stalin and not Anjanenjan. The 15 party functionaries, including former deputy mayor P N Mannan, state executive committee members M Dharmalingam and Ghouse Batcha and the presidium chairperson Isakkimuthu, rose to their positions only because they were close acolytes of Alagiri. Now Stalin wants to bring them around and win over their loyalties, according to local DMK workers. The notice also sought an explanation as to why the names of the 15 functionaries were not in the posters put up by the DMK urban unit for the celebration. Earlier the same set of party leaders were served notices on April 2012 for not participating in the DMK public meeting convened by Stalin on April 14, 2012, to condemn the power tariff hike. Meanwhile, Alagiri loyalists have justified their boycott. Their defence is that Stalin’s supporters too did not participate in Alagiri’s birthday celebrations in January, and they were not served any notices. They said in the earlier case they boycotted the public meeting because it was organised in the absence of Anjanenjan. At this juncture Alagiri is standing by his loyalists. Alagiri has clashed with the high command on earlier occasions too. In the past whenever he felt threatened by senior DMK leaders he egged his supporters to owe allegiance only to him and not to others. As his ways caused discomfort to the party high command, DMK general secretary K Anbazhagan issued a circular in 2000 directing partymen not to have any contact with him. He went into hibernation for two years and came out in 2002 with a protest meeting in Madurai. 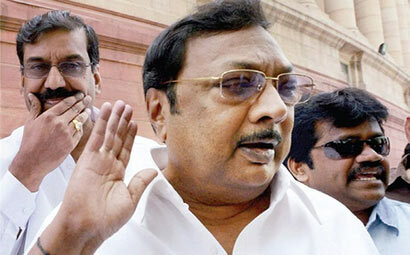 Alagiri wants senior DMK leaders to acknowledge his supremacy in southern districts. But with Stalin not even bothering to visit him when he is in Madurai for party work, Alagiri started sidelining the party members close to Stalin. Now, times are bad for Alagiri. His close associates Pottu Suresh was murdered, that too allegedly by another close associate Attack Pandi. Some other followers have switched to the Stalin camp. The rest have received notices. He, too, lost his ministerial berth at the Centre. How much pressure will his supporters endure to stand by their leader? Only time can tell.